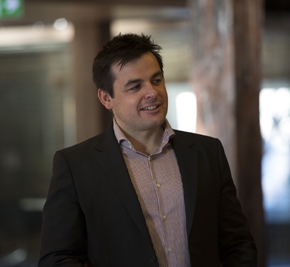 When Intralinks, one of the world’s biggest data rooms providers, named Javier Colado as its Asia Pacific president in May, he almost immediately got on a plane and flew to Australia. Mr Colado and Intralinks are intent on reclaiming their mantle as the top provider of merger and acquisition (M&A) data rooms Down Under. After enjoying a virtual monopoly on Australian M&A data rooms a decade ago, Intralinks’ market share has plunged after a Sydney-based start up ansarada began providing a competing service in 2005.
ansarada, whose headquarters is a renovated warehouse overlooking the Sydney Opera House, now manages between 60 percent and 80 percent of all Australian M&A data rooms running at any one time. Not content with its Australian dominance, ansarada is now seeking to become the data room of choice in the US, Europe and Asia. “We will conquer the world by being committed, focused and passionate about improving the lives of the people we have the privilege to serve,” says ansarada chief executive Sam Riley, whose gregarious, laid back antipodean personality masks a fiercely competitive nature. Years ago M&A due diligence took place in actual rooms. Companies seeking to merge or acquire another would send their acquisition team and advisers to study important financial records of their target in a specially designated room where access was carefully controlled and monitored. Sometimes deal teams would be given just a couple of hours of due diligence. Sometimes they would be given weeks. Now data rooms are online, albeit on secure sites that sit in the cloud. In 2004, Andrew Slavin, a Minsk-born physics graduate of Moscow State University, had been living in Australia just six years when his boss told him the company he was working for was going to be sold. As head of information technology, Mr Slavin was told to assist the buyer and their bankers who were conducting due diligence through a data room. At a dinner celebrating the closing of the deal, the investment bankers began grumbling about the clunky, complicated and confusing software of M&A data rooms. “A light went off,” Mr Slavin recalls. Between December 2004 and January 2005, Mr Slavin worked in his spare time to build a virtual data room prototype. He showed the prototype to Daphne Chang, a financial controller he knew. Ms Chang got in contact with Rachel Riley, an accountant. All three, as well as Ms Riley’s brother Sam, met up at a coffee shop. Mr Slavin pulled out his laptop and showed off his data room design. The four decided to start a company with $30,000 in capital. A year after it was founded, ansarada won the data room contract for the sale of billionaire James Packer’s TV and magazine businesses. Australian investment bankers and lawyers sat up and took notice ansarada was giving such service to a crucial part of the M&A process. They soon began inundating the company with requests they manage other data rooms. “It’s still the case today that social proof and third party recommendations help us, especially in new overseas markets we are developing,” says Mr Riley. After working out of a serviced office, whose dimensions Mr Riley says were so small “you couldn’t swing a cat in it,” the volume of work deluging ansarada forced the company’s founders to look for bigger accommodation and to hire employees. Mr Riley, a voracious reader of business books and biographies, began to think about what kind of company he wanted ansarada to be. In ansarada’s Sydney office, employees whiz to a kitchen for their soy lattes on scooters. Some work out on exercise equipment while over looking a harbor full of ferries, passenger liners and pleasure craft. Software engineers, sales and service personnel, financial and marketing employees sit in front of large screen computers on a raised platform above a vast, polished wooden floor, tasting the sea breeze that wafts in through open windows.